By day Barcelona is an ideal city for pubcrawling, but by day everyone wants to head down to the beach and enjoy the warm Mediterranean Sea. Finding the best beach can be quite a hassle – especially during the summer -, but we at Pub Crawl Barcelona can probably help you out with that! 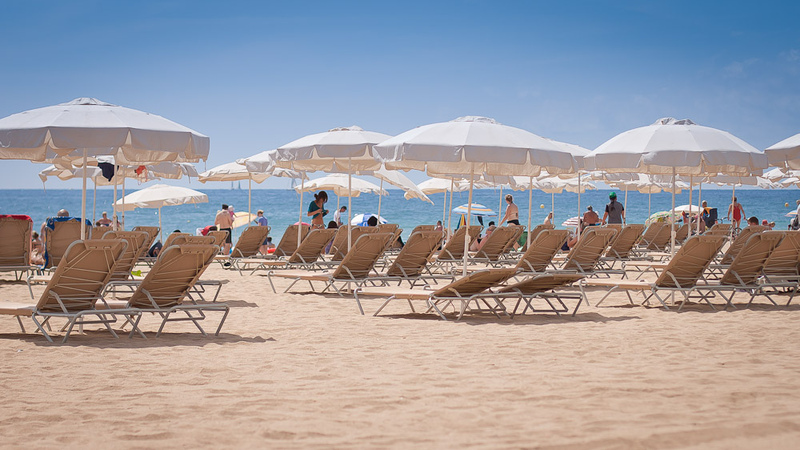 Here’s our list of the best beaches of BCN and area! We start off with the most famous, the largest, the hippest, and that is Barceloneta Beach. Named after the nearby fishing quarter, Barceloneta is the oldest and most loved beach of the city. Come here to have a cocktail, relax, and since the fishies are quite nearby, the seafood is tremendous! Nudists unite! Mar Bella Beach (or sometimes called Marbella), is one of the two nudist beaches of BCN – with the other being Barcelona Santa Sebastia. The large sand dunes of Marbella is popular among the members of the local gay community – but they do have their very own ‘personal beach’. All in all, the bars and restaurants of Mar Bella make it a worthwhile trip for all! We highly recommend restaurant La Oca! This 400 meters strip is frequented among tourists, yet it is widely considered to be one of the most solemn beaches of Barcelona. Families frequent the beach as well, which has great amenities and has a generally chill vibe. That being said, that can be ideal for curing a proper hangover! So, book your pub crawl for tonight and pick a beach from this list for the day after! Partying and beaches, after all, do go hand in hand!